Srinagar, Jan 18 (KNS): Joint resistance leadership (JRL) comprising of Syed Ali Shah Geelani, Mirwaiz Muhammad Umer Farooq and Muhammad Yasin Malik on Friday called for a complete shutdown at Gaw-Kadal, Basant Bagh, Kani-Kadal, Chota-Bazaar, Budshah chowk and its adjacent areas on 21st January. “On that fatal day, a crackdown was held at Chota-bazaar, Kani-kadal areas where thousands of men women, children and elderly were subjected to severe torture, torment and humiliation,” they said. “People from Kursoo Rajbagh to Rawalpora and Kani-kadal to Lal chowk came out on streets against this military crackdown and this people’s protest was showered with bullets near Gaw-Kadal killing many innocents instantly,” JRL said, adding that this massacre was followed by carnages at Handwara and Kupwara where hundreds of Kashmiris were gunned down by police and forces with impunity. “United India during its struggle for freedom against British witnessed only one Jalianwala Bagh but Kashmiris have witnessed dozens of such massacres carried out by Indian forces from 1990 and this slaughter is still going on unabated,” they said. JRL said that the sole aim of India is to terrorize people of Kashmir through these massacres and put an end to the resistance movement but India failed to do so in past and will fail to do so in future too. “In 1990, people of Jammu Kashmir started a people’s revolt against occupation and to crush this people’s resistance, at the orders of Indian political leadership, Army and forces started its killing machine and massacred thousands of people in cold blood and this carnage is still going unabated,” JRL said. “The nation of Kashmir is indebted to martyrs who laid down their lives for freedom and resistance leadership pledges to continue this struggle till the achievement of the sacred goal. Days like 21st, 25th and 27th January 1990 remind us of the sacrifices rendered by our dear ones. 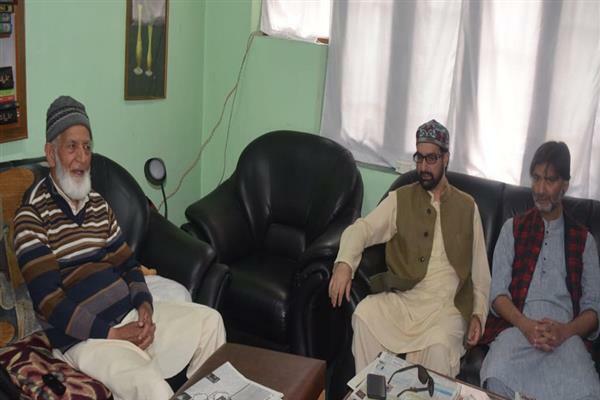 These are the days for reiteration of our commitment towards the sacred mission and today while recalling these great sacrifices we reiterate our pledge to take forward the task of martyrs till the achievement of the desired goal,” JRL said.